This past weekend while walking through Pikes Place Market in Downtown Seattle I stumbled upon Me & Mom’s hats, great booth full of adorable hand-crocheted hats. 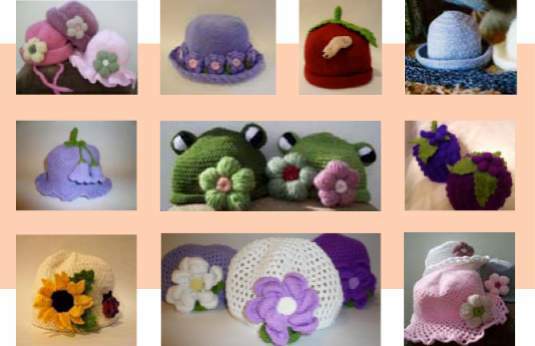 These adorable hats are made in sizes ranging from newborn to adult and come in many different colors and designs! Check out all of these great hats at shop.seattlehats.com. Need a Back to School project? What better way than to start the school year off with a homemade pencil pouch to carry all of your things in! You can add beads, sequins, ribbons, or whatever your style may be with the simple patter from Laylock designs! Gauge: 13 sts / 20 rows to 10cm / 4in. Finished size: 18cm x 11cm / 7in x 4¼in. I recommend an acrylic or acrylic-blend yarn, so that your pouch is less likely to sag or felt with use, or pill when you slide the beads around. Use needles smaller than the yarn calls for, to get a sturdy fabric. The beads need to be the right size to stay put when strung on the yarn, but should slide along easily when pushed. Large beads that stand out too far from the fabric make it difficult to gauge the length of the “swags”, so I recommend medium or smallish beads. Mine were 1cm wide. String your beads onto your yarn in this order: 5 of the lighter shade, 5 of the darker shade, 5 of the lighter shade, 5 of the darker shade. The beads you will knit first are therefore strung on last. A small crochet hook will help, if you can’t get your tapestry needle through your beads. You’ll need to keep pushing your beads along as you knit. Work 4 rows in st st.
ROW 5: K8, sl 10 sts pwise wyif, push 5 beads up to the last knit stich, so they lay in front of the slipped sts, leaving enough slack for the beads to slide k next 2 sts tightly, k6. Rep. rows 5 – 8, 3 times more. Work in st st until piece measures 11cm / 4¼in, ending with RS facing. Next ROW: P across. (This forms the fold). Continue in st st until back measures 11cm / 4¼in from fold. Cast off. If you choose to line your pouch, hem your fabric all the way around, then sew it 1cm / 0.5in in from each side of your pouch. You may want to stretch your pouch as you go. Open the zipper, pin and sew it onto your pouch. I recommend working by hand, unless you’re a sewing machine whiz. Try to sew just under the cast on & cast off chains, as they will border the zipper nicely. Mattress stitch the sides of your pouch. Thread the cast off tail onto your tapestry needle, and pull your needle away 25cm / 10in from the pouch. Twist this length of yarn, keeping the rest of the yarn untwisted (you’ll be using it to secure the tab, but trim it a little, if that makes it easier). When you have enough twist that the yarn kinks up on itself, fold it in half, and even out the twist. Then insert the tapestry needle near where the tab emerges. Fold the tab into a loop, and sew the loop down. Secure the threads with a knot. You’ll need to cut the needle loose, but it should be ok, as long as you’ve knotted it well. Cut a length of yarn approx. 25cm / 10in long, and pull a loop through the eye of your zipper. Then pull the ends of your yarn through the loop to form a lark’s head knot. Thread a large bead through both strands of yarn, secure with a knot. Trim off any excess.